Men's and Women's eights from the universities of Sydney and Melbourne will meet on The Yarra River for the Annual Australian Boat race on Sunday morning 22nd October. Over recent years Sydney has dominated the men's race and Melbourne is unbeaten in the modern era since 2010 in the women's race. The Yarra course begins in Toorak and the crews will race into the city finishing just before Princes Bridge. The course will pass under six bridges starting with the Church St bridge in Toorak just after the start. Crews will pass a number of landmarks including AAMI Stadium, the MCG, Federation Square, Boathouse Drive, Flinders St Station, Federation Square. The course length is approximately 4.5 km. This course was first used for the modern Australian Boat Race in 2013 when there was a controversial clash in the men's race which put Sydney out of contention. The Australian Boat Race Yarra Course starting on the right in Toorak and finishing just before Princes Bridge in central Melbourne. The Australian Uni Games will be held on the Gold Coast from 25th-29th September. The rowing will be on Wyaralong Dame near Beaudesert about an hour north of the main venues around Surfers Paradise. Women: Dyone Bettega, Rebecca Harrison, Wallis Russell, Laura Triggs, Olina Parish, Rebecca Humphris, Georgie Masters, Harriet Hudson, Adelaide Scott, Michaela Franz, Jaime Ford, Lizzie Treloar. Coaches will be Dustyn Butler, Don McLachlan and Debbie Fox. The 2015 Gold Cup Regatta will be remembered as an historic occasion. The day on which a new Women’s Gold Cup was presented to St Ignatius College for the Women’s Eights and a day on which the Women’s Eights (now only 6 years old at this regatta) would stand on equal footing with the men’s eights event. The new Riverview Women’s Challenge God Cup was manufactured by Melbourne sculptor Jennifer Mann and commissioned on behalf of approximately 35 donors by the leaders of this project and Rowing NSW. The cup acknowledges the style and size of the original Gold Cup which was donated to St Ignatius and the Regatta by subscription of residents of Lane Cove in 1893. Fayette the women’s eights the head of Women’s Gold Cup project, Chris Noel made a speech about the motivations of the donors and the hopes they this trophy would inspire the same traditions as the original Gold Cup. Julia Bell, representing the 2001 Australian Women’s eight (the crew is etched on the trophy) spoke of her hopes for this trophy and on behalf of the donors presented the cup to Dr. Paul Hine, the Headmaster of St Ignatius College. The first race for this trophy saw a great battle between the UTS and Mosman crews with UTS leading around the pile but Mosman finishing strongly over the final 200 meters to take victory by only 0.22 seconds. The speech at the presentation is printed below along with the donors who made this possible. Traditions are a great thing when they promote something worthwhile and great traditions only stay great when they are honoured, continued and renewed. What a great tradition is the Gold Cup Regatta. For many rowers – including myself – rowing in the Gold Cup Eights is among the really cherished memories of a rowing career. Six years ago the then Headmaster Shane Hogan suggested and the regatta committee introduced the women’s open eight to the program with the aim of encouraging more women’s participation in the Gold Cup. In 2012 The Regatta Committee thought it would be a good idea to have a suitable trophy for this event that reflected the importance of creating a tradition for the women’s eights that the men’s race has enjoyed for over 120 years. In the spirit of the original Gold Cup we wanted to raise funds for this trophy by donation subscription just as happened with the citizens of Lane Cove subscribing to the original Gold Cup. Around 35 rowing clubs, school rowing committees and individuals have contributed to make this trophy possible. They are listed in the program – I thank all of them for supporting this trophy and a new tradition. Many of them are with me here around the beach. On behalf of all those donors we sincerely hope that in 120 years this new trophy will develop the same traditions of the original Gold Cup. The trophy itself draws on the style of the original cup – we were cognizant of the small size and unique design of the original and accordingly commissioned Jennifer Mann – a well-known sculptor from Melbourne – to design a gold – plated cup that had some unique points but complements the existing men’s cup. The trophy is titled “The Riverview Women’s Challenge Cup” and the handles are decorated with gold waratahs – our state’s flower. On the body of the cup is an etching of the 2001 Australian Women’s Eight – World Champions that year - and on the base the inscription reads – “Presented to St Ignatius College for the Annual Gold Cup Regatta by the Rowing Community of New South Wales”. Finally could I thank Rowing NSW CEO Tony Blower and Office Administrator Melissa McCormack who registered this project with the ASF, promoted it on the Rowing NSW website and processed donations. I would also like to thank Deanna Fekete who worked with me in rounding up donations. St Ignatius College – you have been an excellent custodian of the original Gold Cup. We – the donors- know that this new trophy will be looked after by St Ignatius College in the same way as the original. I will now ask Julia Bell (Wilson when she rowed) to say a few words and present the trophy to Dr Hine. DONORS: Mosman Rowing Club, Sydney Rowing Club, Sydney University Boat Club, NSW Union of Rowers, Loreto Kirribilli Rowing, Old Ignatians Rowing Club, Chris Noel, Phillip Sharp, Ann Koutts, John Croll, Bernard Smith, Will Liley, Jenny and Graeme Allen, Alison and Paul Gotch, Jim Busteed, Rob Scott, Lionel Robberds, NSW Union of Oarswomen, John Coates, Paul and Lisa Lee, Adam Vine- Hall, Terry and Jane O’Hanlon, Deana Fekete, PLC Sydney, Ellen Randell, Debbie Fox, Anthony Blower, Gillian Campbell, Stephen Donnelly. Ann Stormon, Phil Rossi, Thea Wheatley, Freya Wheatley, Linda McDonald. Fergus Pragnell and Sasha Belonogoff both returned from the 2014 World Rowing Championships in Amsterdam with bronze medals - Fergus in the men’s four and Sasha in the men’s double scull. Both, with help from their crew, were able to reverse last year’s result on the Yarra and take Sydney Uni men to gold. Fergus came into his familiar stroke seat and while Sasha moved from sculling to sweep in the five seat of the Sydney University men’s eight. Fergus has extensive experience in the stern big boats – he has won seven consecutive Kings Cups for New South Wales and always in stroke or seven. He had stroked the Sydney men’s crew in the Australian Boat Race in 2011, 12 and 13. Earlier this year Sasha had won both the national men’s single scull championship and the President’s Cup single scull in the Interstate regatta. Joining Fergus and Sasha were national senior representative scullers Nick Hudson and Cam Girdlestone in seven and two respectively. 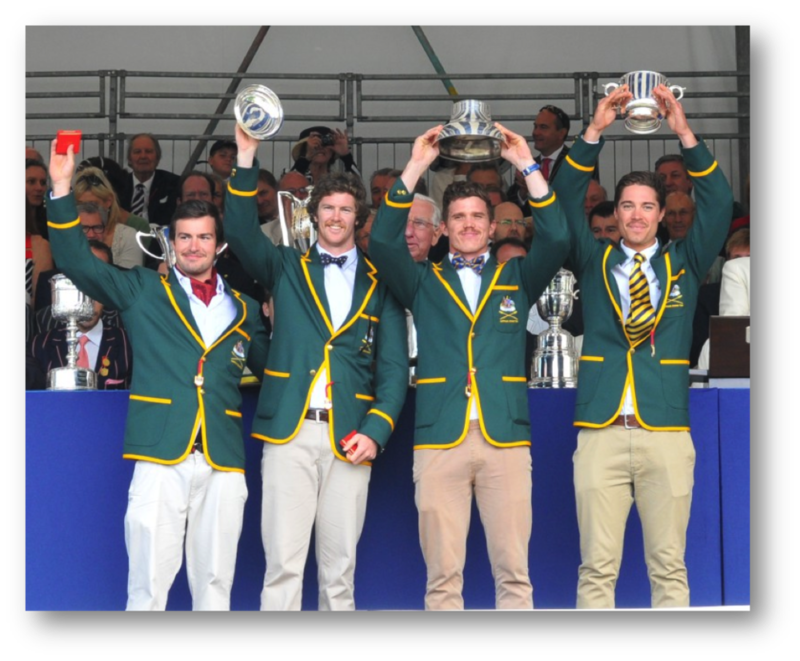 Alex Purnell (Australian U 21 rep was bow) and three first year students from the eight that won the Championship event at Canadian Henley in August rounded out the crew – Campbell Watts in six, Tom Whitehead in four and Jake Bicknell in three. Experienced cox Will Raven took the coxens seat. Sydney won the toss and chose the southern lane which they felt would suit their plan to push through the mid part of the 4.4 km course. Melbourne’s situation was not helped when their captain, Josh Booth, was ruled out on medical grounds just as he was about the board a flight to Sydney on Thursday. Sydney pushed hard around the kilometre mark and from 1 to 2 kms were able to push out to a solid lead. A dominant all- around display by Sydney Uni rowers saw them take out both the Men’s and Women’s Overall Championships at the 2014 Intervarsity Rowing. The regatta held over 3 days in spring condition at the International Regatta Centre saw some important wins but our team and consistently good performances in all events entered. The men’s eight backed up their 2013 win in the Oxford and Cambridge Cup with a strong performance to hold out an excellent Monash eight with Adelaide third. With six new faces from the crew that won in 2013 of which four are in first year this was a result the club, the crew and coaches can be very pleased with. Many of the crew were in the successful eight that took out the championship event at Canadian Henley in July. Sydney worked their way into the lead well before the halfway mark and took their lead to 3.6 seconds on the line. SUBC has now moved to 38 wins just 4 wins behind our arch rivals Melbourne. The Sydney men, led by 2014 World Championship bronze medallist, Sasha Belonogoff also won the coxed fours, the mixed eights and the lightweight single scull ( Jack Hanley) and came second in the mixed fours. Our women’s team won the women’s quad and placed second in the eight. The men were awarded the Bill Webb Trophy (men’s Champions) and our women the Amanda Young Rose Bowl as women’s champions. The Bill Webb trophy was donated in 2006 by the rowing alumni if SUBC and St Andrew’s College in memory of Bill Webb. Bill won the intervarsity eights in 1961-62 and served as doctor for the Australian Rowing Team for nearly 25 years. The Amanda Young Rose Bowl commemorates Intervarsity rower Amanda Young. Amanda from University of Western Australia contracted meningococcal meningitis at the intervarsity held in Penrith in 1997. A week later Amanda passed away at the tragically young age of 18. Murray Clarke arranged for this trophy in her memory and the cup was donated by the University of WA. With both teams winning Sydney University took out the Overall AUG Rowing Championships and the Centenary Cup for 2014. Congratulations to our coaches, Rick van Hooydonk, Debbie Fox, Mark Prater, Ester Verberg and thanks to Australian University Sport and the host and regatta operators, Rowing New South Wales for a well-run and well attended event. Three Sydney Uni rowers in the national senior team have won medals at the recent World Rowing Championships which concluded on 31st August Held on the Bosban in Amsterdam the event provide a mix of conditions and changeable weather. Medallists from SUBC were, Fergus Pragnell in the men’s four, Sally Kehoe in the Women’s double scull and Sasha Belonogoff in the Men’s double scull. The men’s four started their campaign with a second place in their heat behind the British crew and then won their semi-final ahead of Greece and Netherlands to take lane 4 for the final. They recovered from a disappointing performance at the Lucern World Cup to grab third behind favourites Great Britain with USA second. The women’s double scull, stroked by Sally Kehoe, won their heat and their semi-final and went into lane 4 also in the final. The crew started well and moved into the lead in the second 500 trying to establish a winning break – the favourites New Zealand came from well down in the field to push through for gold, Poland passed us to take silver and Australia bronze. The final medal – again bronze- went to Sasha Belonogoff in the men’s double. This was an incredibly tightly contested event with Croatia winning the final with an outstanding row but the following three crews were separated by only 0.14 seconds. The Aussie double of Sasha and James McRae managed to retain third just one hundredths of a second behind Italy and 0.23 ahead of Lithuania. Both Fergus Pragnell and Sasha Belonogoff are likely to be available for the Sydney University men’s eight for The Australian Boat Race to be held on Sydney’s inner harbour on Sunday 26th October. The Boat Club’s No 1 eight equaled the record for the most consecutive wins in the historic Riverview Gold Cup held last Saturday (30th Nov). This iconic trophy is a small solid gold cup presented by the citizens of Lane Cove in 1890 for competition at the annual Riverview Regatta. The trophy is decorated with Australian flora and fauna motifs reflecting the social and political interest of the times as Australia discovered its national identity and moved towards Federation. This tiny cup is coveted by clubs and schools and its 120 year list of winners chronicle who was the leading rowing club in men’s competition over that period. It is also one of the few harbor regattas where clubs will field their top crews in what can be challenging conditions. The win by Sydney University eight on Saturday was the sixth in a row for SUBC and equaled the record established by Sydney Rowing Club from 1978-83 for a straight club crew. Sydney University has now won this event on 10 of the last 12 years – a feat not previously matched. The 2013 God Cup looked to be shaping as a hard fought battle between Sydney University and Sydney Rowing Club and these two crews progressed easily into the final drawing the centre lanes with Sydney in lane 2 and Sydney University on their outside in lane 3. The favourites started the 1400 metre course evenly. In such a short race early speed is important. Sydney looked to be making ground early with their initial rating up at 44-45 and university at 41. As the crews settled it was these two boats drawing well away from the other finalists Scots and Sydney No 2. The course is and 1100 metre run to a 40 degree dog-leg turn and then a 300 metre straight to the finish line at Riverview wharf. The university crew had a slight lead on Sydney as they moved towards the turn at the “leaning pile”. As the crew straightened the course announcer called Sydney Uni maybe a quarter to one third length ahead. Stroke Nick Wheatley and 7 man Nick Purnell pushed a dynamic rhythm to their crew as the rate increased in the university boat and they began extending their lead quickly in the final 250 metres, drawing away from Sydney Rowing Club to gain clear water and cross the line over a full length clear. The recorder margin was 3.23 seconds. With incoming tide and tailwind the time was a quick 3 mins 46 seconds. The Sydney crew was led by 2013 World Championship silver medalists (men’s four) Spencer Turrin and Alex Lloyd with London Olympic silver medallist (also men’s four) and six time King’s Cup winner James Chapman. 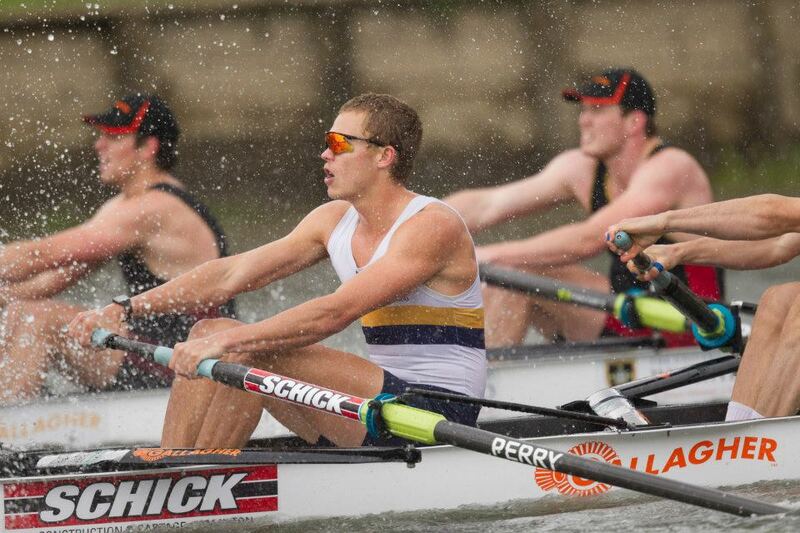 The Sydney crew was steered by cox Angus Bagby (2013 Australian U23 eight). Coach was Tom Morris. The Sydney University crew was stroked by Nick Wheatley (2013 Australian U 23 eight) and coxed by Will Raven (2011 and 2012 Australian U23 teams). Nick Purnell (London Olympics stroke of Australian men’s eight) along with Sasha Belonogoff (National team double scull 2013) and Australian U23 reps Pete Koster, Cam Girdlestone, Hamish Playfair, Kit Cunningham-Reid and Jack Hargreaves. Crew was coached by Mark Prater. Finals day Friday 3rd October at the Australian University Championships saw a gold rush for the Sydney Uni men’s team as they progressively won most of the small boat finals through the morning. The team of eight rowers, 1 sculler , cox and coach Rick van Hooydonk opened the day with Pete Koster and Tom McClintock winning the men’s double scull, soon after SUBC veteran Sasha Belonogoff teamed up with 2013 national junior rep Alex Purnell and Harry Foxton and Ben Scott and steered by Will Raven to take gold in the men’s four. Soon after James Davies, somewhat unexpectedly but decisively crossed first in the men’s single scull and to finish off the small boats Jonny Rundle and Kit Cunningham-Reid then comfortably won the men’s pair. The coveted Oxford and Cambridge Cup for the men’s eight was the final event for men and our small boat crews combined to face Adelaide, Monash, Melbourne, ANU and Uni of NSW in the final. The result – an all the way win to SUBC crossing the line 7 seconds clear of Adelaide Uni with Monash in third. The cup is heading towards Sydney for the first time since 2007. The men’s team combined with our women to also win gold in the Mixed Eight and silver in the Mixed Four. The women’s pair of Ellie Winstanley and Lydia Yerrell won the women’s pair while the Women’s Eight and the Women’s Lightweight Quad won silver medals. The overall result saw SUBC take out the Overall men’s championship. The Sydney Uni Women’s team was runner up in the Women’s championship and the Sydney Uni teams were declared the Overall 2013 Australian University Rowing Champions. Congratulations to all team members and particularly to all our coaches and the lead team coaches Rick van Hooydonk and Debbie Fox. What a race. The Gallagher Great Race is an elaborate event that has the twists and turns to set it apart from any other race. To top that off, you are competing against other crews for the best position on the 3.85km course to avoid the oncoming stream that can ruin even the best boat’s speed. This year, Sydney University Boat Club competed against a strong and experienced Waikato University Crew and some fresh faces rowing for the Cambridge University Crew. Our crew was defending the Harry Mahon Trophy, which we had won on our second attempt in 2012. “The erg challenge on Thursday night resulted in Waikato having first choice of lanes taking the middle starting station, followed by Cambridge choosing the western bank, then Sydney University being left to start on the east station. We had known leading into the erg that the result would play a key role in the way the race on Sunday would pan out, being left out in the stream in the eastern station, we knew we had a hard task to be able to take the early lead that often wins river races like this. We had a strong start, but due to heavy stream after the first crossing we didn’t have the desired overlap to force Waikato into the stream. Shortly after the first crossing Cambridge were forced out into the stream by a surge from our Sydney crew, and were left at the back of the race pack. Cambridge had many pushes, but to the credit of the Sydney Uni crew we were able to counter them, and move away throughout the remainder of the race. With Cambridge out of the way, the hunt was on for Waikato. The remaining two river crossings did not offer any tactical opportunities to cross in front of Waikato and establish position on the inside of the bank, due to the Waikato crew having similar tactics of crossing as early as possible, so as to not allow us any chance of passing as the Sydney Uni crew did to them last year. The only remaining opportunity for the Sydney crew to win was in the final stages of the race, with the leading crew through the last bridge having to pull into the stream for the final hundred metres of the race, this allowed the remaining two crews a opportunity to sprint home for the win. With our crew having closely tailed the Waikato crew at all crossings, and not letting them out of reach through the majority of the race, the sprint was beginning to look like a real possibility. The margin as Waikato pulled out into the stream was half a length clear water; the Sydney crew lifted, but was unable to close the full length and a half to gain the lead. The final result was Waikato; two thirds of a length back to Sydney University, and a further few lengths back to Cambridge University. A huge Thank You to the Gallagher Great Race Team for hosting such an enjoyable week of Gala Balls, Crew Dinners, Erg Challengers and so much more. Also, Thank You to our crew sponsor’s, Foster Construction, for their support throughout the campaign. The Championship Men’s eights of NSW were contested by SUBC, Sydney Rowing Club, Mercantile and Melbourne University from Victoria, Pine Rivers, Queensland and Canberra. The Sydney University crew was cox: Toby Lister, Fergus Pragnell, Hamish Playfair, Nick Purnell, Sasha Belonogoff, Ryan Edwards, Kit Cunningham Reid, Jack Hargreaves and Cam Girdlestone. Staring on the southern bank in lane 2 the SUBC crew too an early lead of two seconds over Sydney at the 500metre mark, extending this gradually to 3 seconds at the 1500 metre point and 3.7 seconds at the line. Sydney were missing James Chapman through injury but lead by their excellent AIS based pair of Spencer Turrin and Alex Lloyd they fought hard all the way to stay with the university boat. The battle for the bronze medal was tight between the two Victorian clubs with Mercantile just edging Melbourne University from the medals by 17 hundredths of a second. The 129th Riverview Gold Cup Regatta was held on the Lane Cove River last Saturday (1st December) in scorching conditions tempered at times by a light sea breeze. The Gold Cup men’s eights was considered by pundits as a contest between Sydney Rowing Club and Sydney University with most feeling Sydney were slight favourites. On the day Sydney had to withdraw Chris Morgan (Simon Nola) while Sydney Uni had to sub for Ryan Edwards and Sasha Belonogoff (illness) and Tom Sacre (recovering from a push bike accident). Both crews won their heats and their semi-finals with comparative ease though SUBC showed signs of some good form with a faster time. Sydney University were fortunate to have Fergus Pragnell come up from Melbourne on Thursday to train with the eight and take the stroke seat. For the final Sydney were drawn in lane 2, University in 3 with St Ignatius Riverview in lane 1 and Kings lane 4.The tide was running out ( against the crews) and near low point while there was a very slight tail breeze. The Sydney University crew pre-race talked about the need on such a short course (1400 metres) to take an aggressive approach, maintain a high rating but row with smoothness and composure. Because of the dog-leg course the crews have a staggered start. Both the favoured crews move out of the start quickly above 40 and it seemed that Sydney University might have just a seat advantage at the 200 metre point. The uni boat had settled at 40 strokes with Jonny Rundle in 6 backing up the rhythm from stroke Pragnell. At the 500 metre mark the Sydney Rowing Club crew moved up and took a slight advantage. From here to the 850 mark the two club crews fought a battle for the lead as the crews raced almost evenly. At the 850 mark a surge by Sydney Uni saw them take seats quickly and by the leaning pile the lead had extended to three quarters of a length. Riverview were running third and Kings School in fourth. As the crew rounded the pile and straightened for home it was Sydney Uni upping the rate to 41 who moved out to clear water over Sydney. On the line it was University first in 4.03.8 about 3.5 seconds ahead of Sydney, 14 seconds to St Ignatius in third and 19 seconds to Kings in 4th. Sydney University first won the Gold Cup in 1908 and did not win again till 1962. Since 2000 SUBC has been a regular winner of this prestigious trophy. The 2012 was SUBC’s fifth in a row. For Sydney Uni cox, Toby Lister this was his eight Gold Cup – possibly some sort of record. Interestingly the boat used was the “Gavin Brown” and Empacher eight. Since this boat was purchased in late 2008 it has won 4 King’s Cup, 5 Gold Cups, and 4 NSW Elite Eights Championships. 3 Australian Boat Races and 2 Nationals U23 Eights Championships. The Melbourne University women’s eight and the Sydney University men’s eight are the winners after a wonderful morning of competition at The 2012 Australian Boat Race on Sydney’s Inner Harbour. Blessed with light winds and a partially sunny and partially overcast morning the harbour was at its calmest as the four crews warmed up on the Lane Cove River. The women’s eights we first up and Melbourne was favoured having won convincingly in the two match races so far in 2010 and 2011. On board was Phoebe Stanley who most recently stroked the Australian Women’s eight at the London Olympics. Melbourne had won the toss and chosen the northern station. The crews tucked into the Woolwich shoreline under the direction of umpire Barbara Ramjan who dropped the flag at 8.20 am and the crews were away. Both crews started strongly and after 400 metres rounded Greenwich Point neck and neck. In the run across to Long Nose Point Melbourne seemed to have a smoother ryhthmn and pulled out to a length lead. Across Snails Bay Melbourne increased their advantage to hold out to four lengths by Simmons Point at East Balmain. Just after East Balmain the Sydney women pushed hard and cut the lead of Melbourne slightly but were not able to get close enough to really challenge. Melbourne’s steady stroking and good technical work brought them into the final southerly reach to Darling Harbour well ahead and they maintained and improved their lead through to the finish at Cockle Bay marina to record a six length victory. The Sydney team made up ground on the 2011 result but have a lot of improvement to if they are to aspire to victory on the Yarra in 2013. The New South Wales Minister for Sport, Mr Graham Annesley presented the Bella Guerin trophy to Monica McGauran the crew captain of Melbourne University while Sydney University’s Vice Chancellor Dr Michael Spence presented Australian Boat Race medals to both crews. Next up was the men. This event had been a titanic struggle in 2011 on the Yarra with the lead changing several times and Sydney prevailing by just “inches”. On paper Melbourne had an improved crew for 2012 filled with national senior and U23 oarsmen. Both crews played a waiting game in the start area with neither wanting to be the first to approach the starter as they warmed up. Finally at 9.17 the crews moved into the start zone and umpire Greg Smith began the line-up. Running a minute behind schedule the flag was dropped at 9.21 am and a fierce battle for “king of the harbour” ensued. Initially Melbourne held the slightest of advantages on the northern station. As the crews passed the Greenwich buoy they were almost level and the noise from blade clashes was clear about the din of the following flotilla as Sydney cox Raven seemed to try and hold Melbourne close to the Greenwich shore. As the crews crossed from Greenwich to Birchgrove there were further clashes and some harsh words exchanged between boats as umpire Smith was called in to separate the crews with some stern words of his own. Conditions were smooth and becoming sunny as the 2 km mark approached with Sydney slowly gaining an advantage of a quarter of a length. It seemed that the tempo set by Pragnell (stroke) and Lloyd (seven) was consistent, rhythmical and strong allowing the Sydney crew to move further out. By East Balmain they had a clear water lead of one and a quarter lengths and were looking hard to beat. Melbourne attacked a number of times in the final five minutes with each attack countered by Sydney. The crews passed under Pyrmont Bridge with Sydney five seconds ahead and they held this to the line as Federal Minister for Sport, Hon Senator Kate Lundy dropped the flag to signal the finish of the 2012 Australian Boat Race. Medals were presented to the crews by the Vice Chancellor of Melbourne University, Professor Glyn Davis and the Edmund Barton Trophy was handed to Sydney captain Fergus Pragnell by Minister Kat Lundy. The annual Australian University Games was held in Adelaide from 24-28th September and with the Westlakes course available the rowing was held as part of the Games. The event included a long trailer drive to South Australia which has its share of drama as the main towing bar on our trailer snapped just out of Wagga. Fortunately of Head Women’s Coach, Debbie Fox was able to get the trailer to the side of the road safely but the accident meant a day’s delay as the trailer had to be towed back to Wagga and extensively repaired. Thanks to David Gely, coach of Uni of New South Wales. Dave was following with his trailer and was able to take a few of the Sydney University boats which were needed urgently in Adelaide for the start of the competition. Conditions at Westlakes were poor and on the finals day were almost atrocious with winds gusting to 50 kilometres per hour. Conditions meant crews could not use the start pontoons as the boast were impossible to hold in position and the risk of boat damage was too great. In the final of the women’s eight it was the Sydney Uni women who started strongly along with Adelaide and Uni of South Australia. Sydney and Uni of SA soon opened up a lead on the rest of the field. As the crews reached a patch of better water Sydney cox Gen Fick called for an effort and our girls quickly opened up clear water. In the gruelling conditions other challenges were always going to be hard to mount and the Sydney girls steadily increased their lead through the race. Adelaide pushed past Uni of SA to secure second with Monash fourth and Australian National University fifth. At the line Sydney had a clear 13 second margin. The winning crew was stroked by lightweight Holly Lawrence and the rest of the crew moving down the boat were Marianna Doumanis, India Evans, Nicola Metcalfe, Lydia Yerrell, Kellie Parker, Maddie Cavanagh and Peta Blundell. Our women’s team also grabbed gold in women’s four and the pair. Combined with placings in the lightweight four and the lightweight single (Petria Carter) the Sydney University women were able to take out the Amanda Young Rose Bowl as the overall women’s champions for the 2012 intervarsity competition. This was our new Head Coach, Debbie Fox’s first major competition as coaching our women’s team and special congratulations to her for such a fantastic result. The Sydney men sent only a small team to contest the eight, four and double scull. The crew of John Rundle, Sasha Belonogoff, Tom Sacre and Kit Cunningham –Reid coxed by Will Raven won the four from ANU and Melbourne Uni while Peter Koster and Ben Scott finished with bronze in the double. Unfortunately on the final day Tom McClintock had a rib injury and we had to withdraw our eight – losing the opportunity to race for the Oxford and Cambridge Cup this year. The Gallagher Great Race on the Waikato River was run for the 11th year on Sunday (9th Sept). This year crews in the men’s and women’s eights were from Waikato University and Sydney and Queensland Universities. The day started with quite a bit of rain making things a little uncomfortable for spectators. In the women’s eight Sydney University led by Olympians Sally Kehoe and Sarah Cook took an early lead over Waikato. In this race it is important for crews to stay in close to the bank to avoid the 4 km per hour plus current that flows. At one stage Sydney got a bit wide off the bank allowing Waikato to make a push on the inside and take a lead which they held to the finish. Result: Waikato, Sydney and Brisbane. The crews select their start positions based on the results of the erg challenge. Sydney won this and got first choice of lanes. After a few hundred metres the crews pass the buoys that define the start area and can move to either side of the river. Waikato and Sydney both started well but it was Waikato that eventually prevailed in the race for the bank and the preferred sheltered position. Sydney eventually had to make the decision to tuck in behind Waikato but cox Toby Lister impressed on his crew the need to stay close to Waikato and to be ready when and opportunity opened up. The crews crossed from the left to right bank after about one kilometre of the race with Sydney still close behind Waikato and Queensland in third. Sydney shadowed Waikato till the crews reached the final bridge about 1200 metres from the finish. At this point Waikato decided to move along the right bank but Sydney cox Toby Lister ( Olympic Eight 2012) thought there would be better sheltered water on the left bank made a dramatic river cross and called for maximum effort from the Sydney crew. Sydney began closing the gap on Waikato even as they were crossing in the main current. Waikato countered by moving across but too late – as the crews came together back on the left bank it was Sydney who had the lead and consolidated this to over two lengths with 500 meters to row. Sydney now had the advantageous position and as they were second through the last bridge was able to finish on the bank. However a mis-communication from the umpire’s boat meant that Sydney thought with 200 metres to go they had to move to the centre station and finish within the centre buoys. Fortunately Sydney had built up a good lead and was able to move into the stream and still hold on to a handy margin finishing 7 seconds clear of Waikato University with Queensland in third place. Sydney became only the second foreign crew to win the Harry Mahon Trophy since the race’s inception. On the 21st of July, nine of SUBC’s best young rowers set off for a three-week tour to Canada. 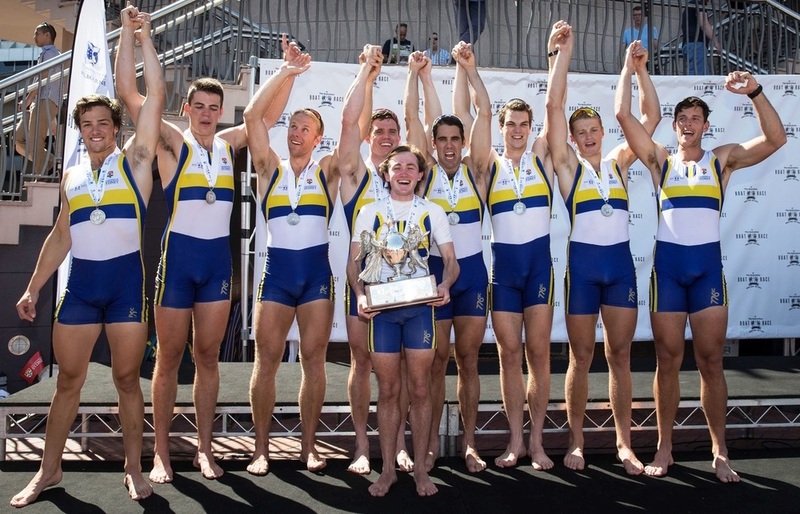 Jonny Rundle, Tom McClintock, Jack Hargreaves, Peter Koster, Kit Cunningham-Reid, Hamish Playfair, Tom Sacre, Nick Wheatley and Ryan Barraclough were joined in North America by one of Australia’s best Under 23 coxswains, SUBC’s Will Raven. Together we formed an eight for competition at the Ontario State Championships and Royal Canadian Henley, with line up listed above from bow to stroke and Ryan as specialist sculling reserve. Our coach was noted “Dutch Touch” exponent Rick von Hooydonk. The trip over was made up of two flights – fourteen hours from Sydney to San Francisco, and five hours from there to Toronto. Aside from leaving us all with terrible jet lag, it gave us a lot of time to mull over what we were walking into. Eights racing in North America is close to a religion – they seem to hesitate over boating coxed fours for being too small and American and Canadian eights had dominated the World Championships and Olympics of the last decade. We knew very little about our accommodation at Ridley College or the equipment we’d be using from their boat club, still less about the courses we’d be racing on or the boats we’d be up against. We arrived at Ridley (a co-ed boarding school in St Catharine’s, home of Canadian Henley) at two in the morning, and many of us struggled to find any real sleep that night. Nevertheless, training began the very next day, and we got to see the boat we’d be getting to know very well over the next three weeks. The George Abady II was an eight year old Hudson, which we were to crew with vintage, non adjustable oars. Coming from the SUBC shed, where the equipment is the very latest, it was clear that we were in for a challenge. Almost immediately we were struck by a variety of misfortunes that are perhaps common in touring parties. Jack, our three seat, was hit by glandular fever and strep throat at the same time, and was unable to row from midway through the first week on. This meant that a few days before the first race, Ryan came into the crew, which forced a reshuffle of the bow four. At first it ran (from bow to four) myself, Ryan, Jonny and Pete, which was later changed to Jonny, Pete, myself and Ryan. To compound the disruption, we were told that because Will had coxed internationally in 2012 (at the Under 23 Championships in Trakai), we would not be able to enter the Under 23 or Senior Eight at Canadian Henley and our race at the Ontario Championships would be an exhibition and we wouldn’t technically be entered. These disruptions did not provide the best platform for our first race – at the Ontario Championships. The race was a straight final with no chance to fine-tune or finalise our racing style. In short, the Canadians gave us a lesson in racing. Two boats from St Catharine’s Rowing Club shot out to the early lead, but it was not so much their speed in the opening quarter that impressed us – it was their ability to replicate that speed three more times over the course. That left us in a battle for third with a crew from Western Ontario. It was here that we learnt the most about how to really race. In a race that was already going to be a St Catharine’s 1-2, the crew from West Ontario would just not let us past, and we ended up finishing fourth. A culture of hard side-by-side racing meant that these crews would not capitulate as we had come to expect. After the humbling experience at the Welland course, we were in for another disruption. While playing some Ultimate Frisbee, Ryan and Hamish collided, with Hamish limping away with a mid-foot sprain. This led to the inclusion of Dan, a Ridley College Graduates rower and Yale graduate, in the eight for a couple of training sessions, as well as a few interesting attempts at rowing in a seven. This was the most difficult period of the trip for the whole group, and Australia’s early struggles at the Olympics did nothing to improve the mood of the crew. However, it was here that we made our best improvements, improvements that would put us in good stead for Henley. It was during those days that we got our first piece of really good news for the trip – Ali Coehoorn (nee Williams) was living in Canada with her husband and would be available at Henley to cox for SUBC once more. We had a coxswain for the senior eight and had Will raring to go in the Championship, but were nonetheless disqualified from the Under 23 eight. A few more days of training and we were, by all appearances, ready to race. The emotions were running a little high in the heat of the Senior Eight, and the lack of a coherent plan hurt us badly. Ali hadn’t trained extensively with us, and was forced to dig into her vast experience coxing and coaching to get us on the same page on the fly. We scraped into the final, with the slowest time of the six boats. In the wake of that race, we had what the media would call ‘a no-holds barred truth session,’ under the guidance of our Dutch Master where we each laid out what our goals were for the tour and how we should race in order to achieve them. Rick was keen that we develop our race planning much more fully as a crew and they we each have input and ownership of a plan that would take us through the entire course competing on every stroke for every place. The result was a much-improved race in the heat of the Championship eight. We qualified comfortably for the final, only four seconds back on the time of the early pacesetters from California Rowing Club. We weren’t able to maintain the rage in the final of the Senior Eight, however. After putting down our best first 1000m of the tour, we couldn’t capitalise, and allowed three crews to cross the line in front of us. The disappointment was even more keenly felt because of how well we had raced for half the race. 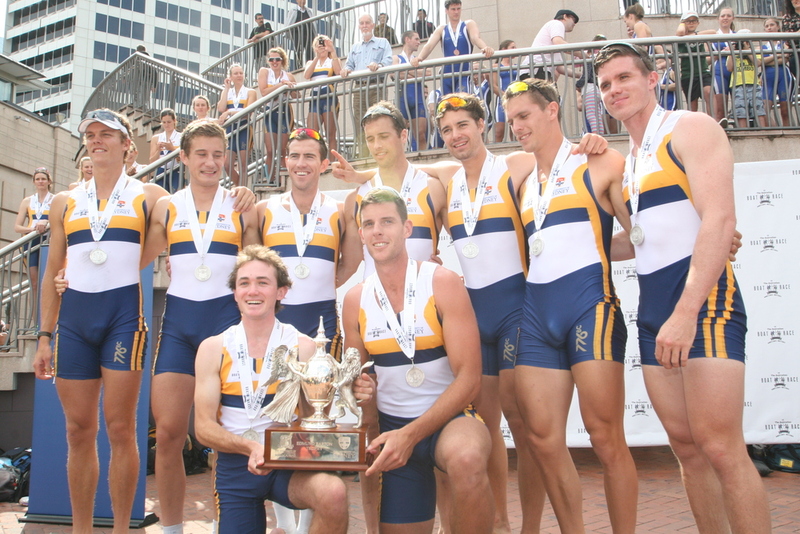 The race was won by a crew from California Rowing Club, which included an ex-Shore boy, Michael Bernerius. As seemed to be the pattern with our races, the sub-standard performance in the final of the senior spurred us to redress the balance in the Championship. Racing a considerably higher calibre of oarsman, including some of the winners of the Grand Challenge at Royal Henley this year, we resolved to leave nothing in the tank. Coxed to perfection by Will, we exceeded the standard we had set for our first half in the Senior Final and then carried that standard through the rest of the race. Two of the best moments of the tour came in quick succession in that second thousand – first burying the California crew, some of whom were winners in the Grand, and then holding off a fast finishing crew from Mendota to finish second. The St Catharine’s crew that had beaten us at Ontario had been augmented by a member of the Under 23 Canadian team, and they were deserving winners. Looking back, it is clear that the tour was not without its hardships, and certainly going in, I would not have envisaged having to battle so much to succeed. As we were told so many times by the elder statesmen of SUBC, however, it’s in those difficult situations that real friendships are made, and memorable careers are forged. Looking at the group that returned to Sydney on the 15th of August, I’m confident that many of them will look back on the tour to Canada as one of the most important milestones of their early careers. The Australian Men’s U23 Quad finished the World U23 Championships with a bronze medal in a tough fought A final at Trakai, Lithuania last Sunday 15th July. The Aussie Quad with SUBC reps Ryan Edwards and Sasha Belonogoff plus Ben Morley of Grammarians Qld and Jay Ditmarsch of Mosman started slowly and were 5th at the 500 mark trailing leaders Ukraine, Italy, France and Czech Republic. With Ukrainians making the pace the Aussies moved to 4th at the 1000 and 1.85 seconds from the lead. At the 1500 our crew had made it into second but the margins from 1st to 4th were 2.3 seconds. In the final 500 four crews pushed their claims for victory and the gaps narrowed. On the line Ukraine took our gold in 5.59.68 from Italy 1.19 seconds ahead of Italy and Australia 0.23 seconds behind in third. France was fourth only 0.37 behind Australia. There were 24 countries entered in the U23 Men’s Quad Scull. The crew was coached by Sydney Uni Rowing Director Mark Prater. Prior to the World Championships the U23 quad had won at 2012 Royal Henley. Out photo shows the crew celebrating after the race in the beer tent. Other Australian crews also had success at Trakai. Tom Morris ( head Coach of Sydney Rowing Club) achieved bronze with the U23 Men’s eight while Tom Laurich’s U23 Men’s Coxless Four won silver behind Germany. This crew was selected from Australian athletes studying at US universities. In the women’s races the Australian Women’s Quad won gold in convincing fashion and the Women’s Four also gained silver. The Men’s Coxed Four steered by SUBC’s Will Raven made the A Final and finished 5th. In all seven of Australia’s eight crews at the U23 Championships made the A finals with five of them winning medals. The Australian u23 Rowing Team competed at Henley Royal Regatta last weekend. Several SUBC members competed for the NRCE (National Rowing Centre of Excellence). They had only been in Europe for a few days, but despite the jetlag experienced some great results. The NRCE Men’s quad featuring SUBC’s own Ryan Edwards and Sasha Belogonoff won the Queen Mother Challenge Cup in a tremendous race, chasing down a strong first half race from Victoria City Rowing Club (Canada) to win by a half-length. Coached by SUBC’s Mark Prater the boys are now training in Lithuania ahead of the World Rowing u23 Championships. Will Raven also experienced some great racing from the coxswains seat in The Grand Challenge Cup (M8+). This crew combines the Aus u23 M4+ that Ravo will be coxing at world championships and the Aus u23 M4- , which has been selected from Australian athletes currently training in the American College system. They experienced some strong racing in a scratch combination but were knocked out in the semi-finals by a strong crew from Brown University (USA). The eventual winners of the event from California Rowing Club were America’s 2nd VIII, the men that just missed out on selection in the US Olympic eight. There was also some royal attention with the queen’s barge making an appearance, though unfortunately the Queen could not witness the exploits of our SUBC athletes! You will be able to view race progress during the World Rowing u23 championships using the live race tracker at www.worldrowing.com from the 11th-15th of July. The Australian U23 Quad rowed from behind in the final of the Queen Mother Challenge Cup. Trailing the Canadian Senior Quad at the Barrier and at Fawley the Australian quad hit the lead with a sustained push only 50 metres from the line and went on to win by half a length, The crew of Ryan Edwards, Sasha Belonogoff (Sydney University) with Ben Morley (Grammarians) and Jay Ditmarsch (Mosman) were having their first and final lead up regatta for the World U23 Championships to be held later this month in Trakai, Lithuania. Sydney Uni’s Director of Coaching, Mark Prater was full of praise for his crew saying they showed real character to come from a length down with 700 meters to go to take out the win. Our photos show the team at the prize giving ceremony and celebrating after. In a great day for the Australian U23 Team the Women’s U23 Quad of Rebekah Hooper, Maddie Edmunds, Jessica Hall and Olympia Aldersey easily accounted for the Dutch Olympic Quad in the Princess Grace Challenge Cup while rowing from what was considered the less favoured lane. In the Stewards Challenge Cup the Men’s U23 Four beat the New Zealand crew by two thirds of a length. On a beautiful sunny and clear Saturday last week Sydney Uni eights captured the double at the 128th Gold Cup – winning the men’s and women’s eights. 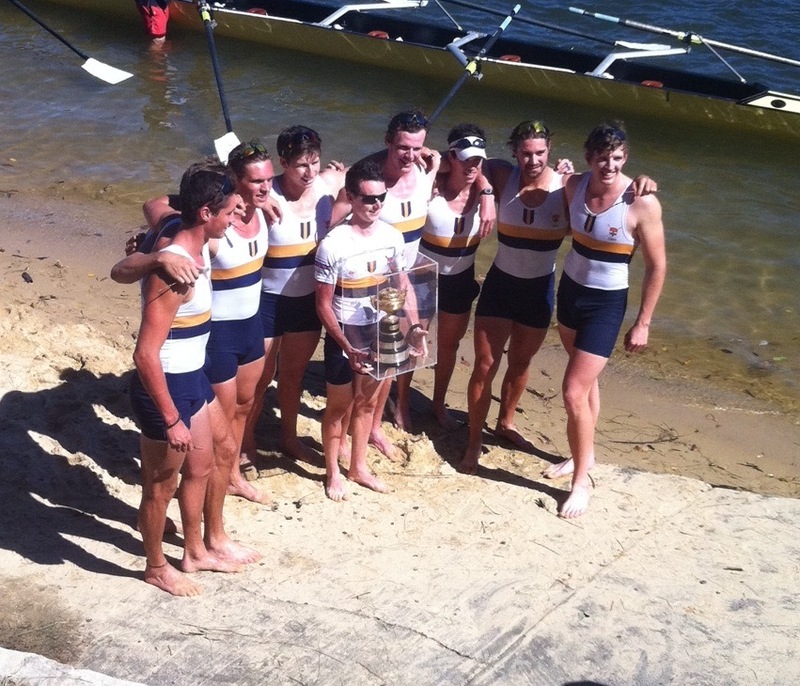 This is the third Gold Cup in a row in which Sydney Uni has won both open eights. In the Women’s Eights our crew lost Greta Beale to illness and faced a very competent Sydney Rowing Club crew but broke away at the turn to win by 1.83 seconds in a time of 4 mins 36 secs. University of New South Wales finished third with Pymble Ladies College fourth and Loreto Kirribilli fifth. In the men’s event the two heats were won by Sydney Rowing Club and SUBC respectively with Sydney Rowing Club posting the fastest heat tome of 4 mins 6 secs. Tony Lister was steering the SUBC eight and hunting for his seventh gold oar. The final saw SUBC in lane 1 on the Hunter’s Hill side, Sydney in lane two with Kings School and Mosman outside them. SUBC started well and by the 700 metre mark had pulled back the deficit from the staggered start. With Lister hugging the south side buoys and shaving the turning pile the SUBC crew covered the shortest distance to turn ahead of Sydney and go to the line a length clear. With the following sea breeze the time was a very slick in just a few hundredths of a second under 4 minutes. Sydney Uni’s other entry was in the Men’s B Fours where our crew of Jon Goddard, Tom Bowditch, Kit Cunningham Reid and Jon Rundle coxed by Will Raven raced two Sydney Rowing Club fours and a Macquarie Uni Four. Another win to SUBC crew – this time from the outside lane (4) winning by 5 seconds.